During my shower routine, I tried the JUARA facial scrub and it was not harsh nor "tinglingly" on my face! Although the scrub was affective in getting rid of dry flakes, I perfer the Vasanti Facial Scrub from Birchbox! I applied the Supergoop! Anti-aging serum on my cleansed face and the white serum instantly vanished in my medium skin tone without a "white residue" before applying my regular moisturizer!! Plus, I love its Anti-Aging and has SPF 30 for the sun safety! I tried theBalm Bronzer/Blush but the color was "too dark" to my yellow/warm skin tone so I used it instead as eyeshadow which complemented my hazel eyes! Last, I tried the Stila liquid lipstick, which is matte that I rarely use in any lipstick form, in Bella (bright pink)!! Great application and color but it was ultra drying to my dry skin/lips!! I discovered that if I use lip balm, lip pencil, and then this liquid lipstick that I can make this Stila lipstick work for me!! After styling my relaxed hair, I sprayed with Oribe Beach Waves and Shine Spray which gave the perfect texture and shine to my hair strands without the "crunchy" look!! 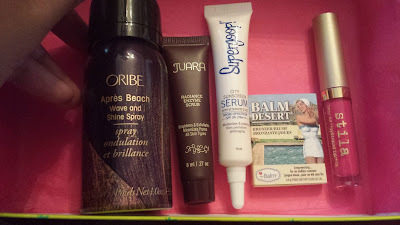 I was able to try out everything in my Beachy and Bright July box and particularly love the Oribe Apres Beach Wave and Shine Spray and the Supergoop! Anti-Aging City Sunscreen Serum!! I will give this box a "5 out of 5" because I was able to use my Juara, Stila, and theBalm products with some adjustments which is always a "Win" in my beauty blogging book! Thank you, Allison! I have selected "large" on my blog but I will try extra large! I have an Ipsy subscription. Sometimes it is a bit hit or miss, but when I love a box it seems to hit all of my beauty boxes. Don't ya love it when that happens?! I know the feeling...a few times I gotten a total "miss" with Birchbox but I love getting the Limited Edition boxes because it gives me exactly what I want to love (or love again) and try something new!! 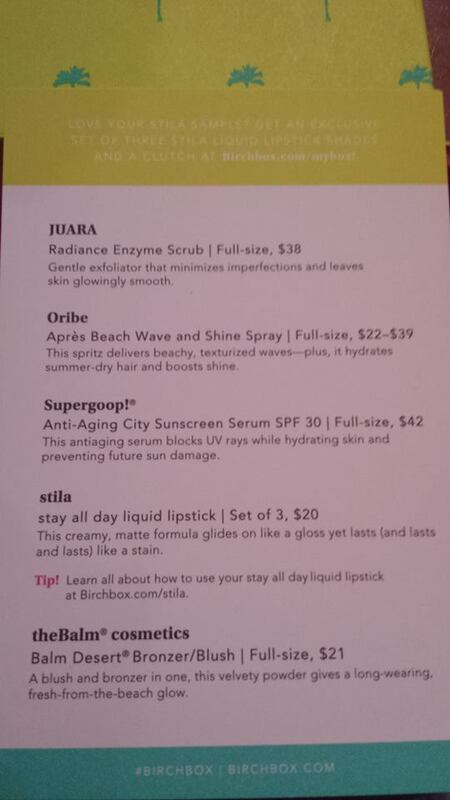 Plus, I get to try items that would be pricey for $10/monthly, which is great for this beauty budgetnista! I wanted to try this one, but wasn't to sure. I love the Stila and theBalm product you got! What fun! I have heard of these and thought it was a great idea!! For $10 a box, it a great deal esp. 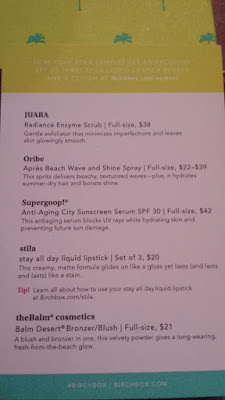 the oribe spray which is $12 approx and trying Stila and Supergoop!! That Stila gloss is a great summer color & any product from The Balm is always great. Looks like an awesome box! I would love to try the enzyme scrub. I've heard that enzymes are great for your face, but I haven't tried out any products with them. That gloss looks like the perfect shade! 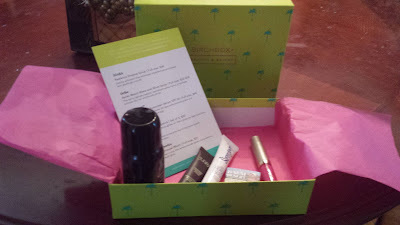 I have been meaning to subscribe to Birchbox again! I love this pink gloss...you should start Birchbox again! Let me know if you do and I will give you my link to start up! I plan to get the "Birchbox and Candidly Nicole" Guest Editor August box! I just like to say "supergoop"... my husband would get a kick out of it to! I'll have to give it a try! We got three of the same products! I've been curious about that scrub and I really want to see how the supergoop works! Supergoop vanishes into my medium tone skin without any white residue!! I gave the scrub a fair rating but I still but the Vasanti scrub #1 on fave scrubs for my dry skin! I've never done a subscription box. This looks like a good one.? Let me know if you want to sign up for Birchbox...they rewards points for sharing links, reviews, and buy products and let you spend them on the stuff you want! Every month my jealousy in you is renewed. Lol. I hope I get a Stila lip gloss in hot pink like the one in your box. I LOVE lip gloss and Stila. I am opening my BirchBox later today, cross your fingers that I have a lip gloss. Great review! I loved the Stila lipstick. It was long lasting and stayed on through dinner and dessert. Glad you like the staying power of this liquid lipstick! !